Our traditional looms and loops are custom made, and are the highest quality out there. 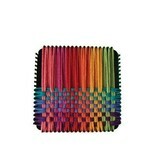 Make colorful potholders for your home, as gifts or to sell as a fund-raiser for your school, church, or club. Our Standard Loom has enough loops to make 2 Potholders, Order the "Deluxe Loom" to get enough loops to make 6! Our Potholder Loom is metal, not plastic! We’ve improved the peg design so the loops won’t slip off as easily while you weave. Sturdy Metal Loom 7" x 7"
Illustrated instructions with lots of ideas.